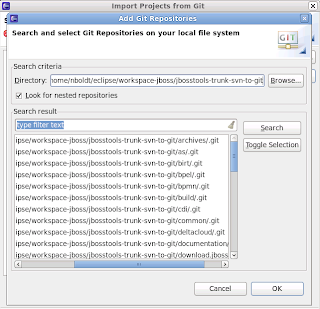 If you'd like to use Git instead of SVN as your SCM tool of choice, here's how you can connect to the JBoss Tools SVN repo, pull down all the sources, work on them locally, then either commit changes back into the SVN repo (or submit a patch, if you're not already a committer). The instructions below assume you have either Linux, Mac OSX, or Windows w/ cygwin. If you have none of those, YMMV. 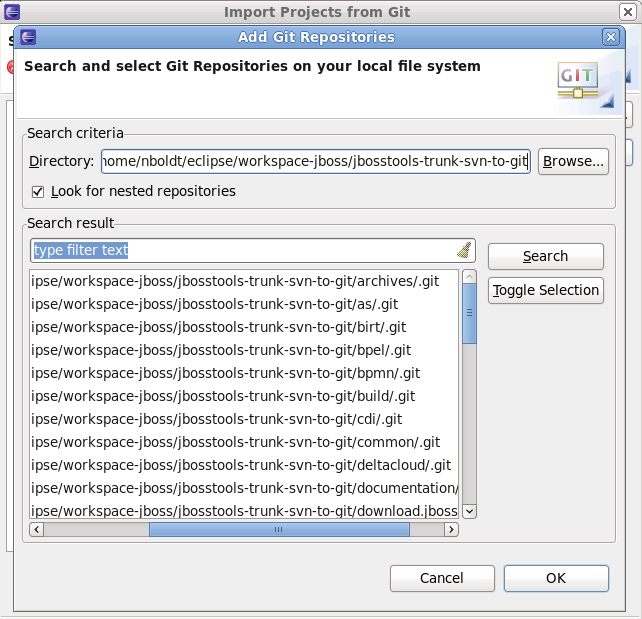 First, fetch sources from SVN using git-svn. If you don't want to check out all the components, use a subset of the components listed below. The complete list is here. Next, fire up Eclipse Helios 3.6 for Java EE Developers. Install the latest eGit from http://download.eclipse.org/egit/updates. Install the latest m2eclipse from http://m2eclipse.sonatype.org/sites/m2e/ and optionally, http://m2eclipse.sonatype.org/sites/m2e-extras/. Repeat for other components you want to import. You can add each component to a working set to keep your workspace sorted by component. JBoss Tools Target Platform p2 Repo (also available as an archived update site zip for offline use) - contains all the Eclipse.org, google.com, and sonatype.org features needed to compile / install all of JBoss Tools. You can install everything, or just the pieces you need. 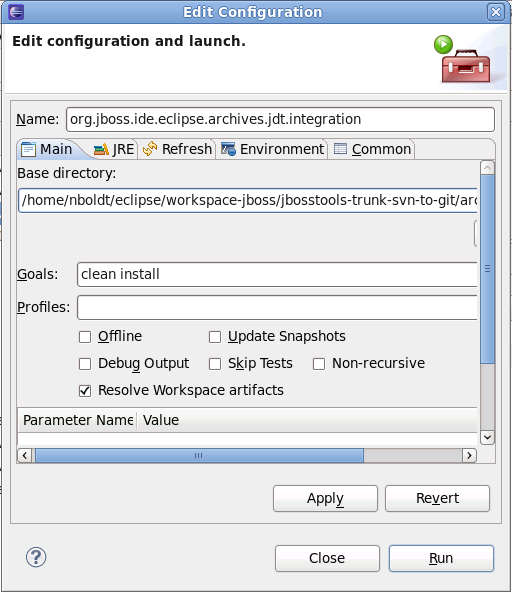 JBoss Tools Nightly Repo (Update Site) - if you don't have all the source projects in your workspace, you can resolve dependencies against this site and install them from here. Once again, you can install everything, or just the pieces you need. 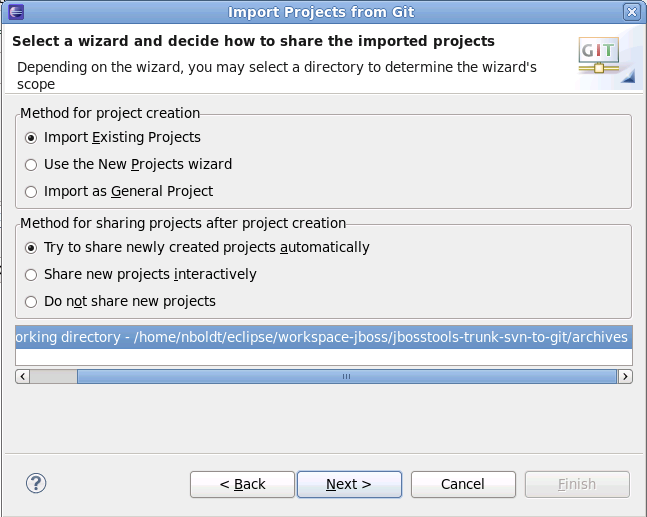 You can also run Maven to build your projects outside Eclipse, if you prefer. 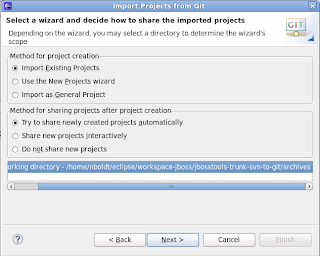 If running outside Eclipse, you can run tests which are still tied to the Eclipse debugger. Because there's no support yet for 'git svn rebase' or 'git svn dcommmit' you're stuck pushing changes to the master repo using the commandline. However, you can shorten the amount of typing needed using an .alias file. See below. Or, put them directly in your .bashrc file.